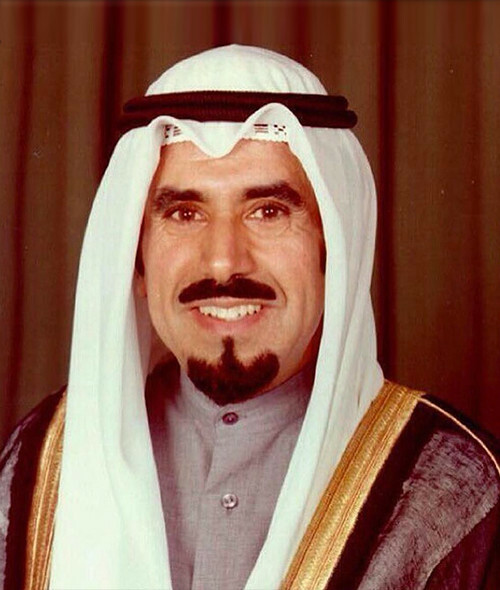 His Highness the Emir Sheikh Jaber Al-Ahmad Al-Jaber Al-Sabah - the thirteenth Emir of the Al-Sabah family and third ruler of Kuwait after its independence - remains one of the most beloved and distinguished leaders of Kuwait. His leadership of the state earned him the reputation of “shepherd of the community”. Born in Kuwait City in 1926, Jaber was the third son of the late Ahmad Al-Jaber Al-Sabah. He received his education at Al-Mubarakiya School, Al-Ahmediya School, and Al-Sharqiya School before pursuing his higher education with private tutors. His reign as Emir of Kuwait began in 1977 and lasted until 2006. During that period, the Emir ruled the country through the instability of the Iranian revolution, the Iran-Iraq war, and the invasion of Kuwait by Saddam Hussein’s armies in 1990. His reign also witnessed the birth of solid friendly relationships with almost all other countries. These relationships, based on mutual understanding and an exchange of mutual interests, worked in Kuwait’s favor more than once in the long run. The Emir survived an assassination attempt in 1985 and then the Iraqi invasion of Kuwait in 1990. After establishing a government from exile in Saudi Arabia, he returned to his country in March 1991, following a US-led military campaign that ousted the Iraqi forces. Throughout his reign, His Highness has wisely managed the political, economic and social affairs of the State of Kuwait, his vision making it possible for the nation to assume prominent leadership positions not only in the Arab and Islamic world but also internationally. Prior to being Emir, His Highness also held the positions of Chief of Public Security in the Oil Regions, Head of the Finance Department, Minister of finance and Economy, Prime Minister, Crown prince, and finally as Emir. The rule of the cherished Sheikh Jaber Al-Ahmad Al-Sabah represents the era that saw Kuwait shine on the global scene as a truly civilized and democratic state. His later years are remembered for his electoral reforms which have seen women take public office. Later in 2007, these reforms gave women the right to vote in parliamentary elections. His Highness has devoted his work and efforts to the noble goals of sustaining human rights and equality, achieving peace and security, supporting democracy and freedom of speech, and maintaining continuous development. The late Emir passed away at 79 in 2006 after leading Kuwait for 26 years. He has left his mark on a grateful Kuwait. His death was mourned by the people of Kuwait and nations worldwide.